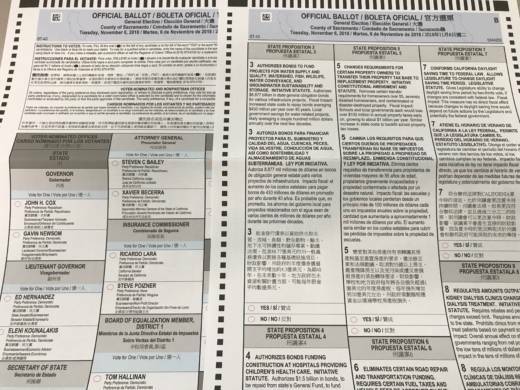 California voters will face 11 propositions this November, but the ballot could have been longer. Backers of three other voter initiatives pulled their measures, using a relatively new state law meant to encourage deal-making. The 2014 state law allows an initiative proponent to withdraw a measure after it qualifies for the ballot. It has created a powerful new tool to leverage state lawmakers — as demonstrated by the events of a single day in late June of this year. The fury on the floor of the California Senate that morning was something to behold. Wiener spoke as lawmakers were debating a bill that banned California cities and counties from adding new taxes on soda. In exchange for its passage, business groups offered a deal: They’d withdraw a November ballot measure that scared Democrats, labor unions and local governments even more. The initiative would have raised the voter threshold for local sales tax increases from a majority to two-thirds, among other provisions. Democratic Senate leader Toni Atkins said lawmakers found themselves between a rock and a hard place. “We certainly will not forget the position we were put in,” she warned initiative backers. But the measure’s proponent says the criticisms are disingenuous. Sacramento Mayor Darrell Steinberg was among the local government leaders who considered the soda tax ban the lesser of two evils, because he’s championing a majority-vote local sales tax measure this fall. Ironically, back when he led the state Senate, he wrote the law that made this tactic possible. Steinberg says the goal of his measure was to encourage negotiations between initiative backers and elected officials. Opponents of an initiative, he points out, can always turn down a deal and take their chances with voters. And Lapsley, who worked with good government groups and union leaders to suggest the law to Steinberg, pointed out that initiatives have always been used as leverage, if not as explicitly. Senate Leader Toni Atkins’ office says she’s open to revisiting the law to improve on its intended purpose, but discussions on that issue have yet to begin in earnest. It isn’t just big business that has used the new law. On the same day the soda tax ban passed the Legislature, a Bay Area real estate developer named Alastair Mactaggart brought the tech industry to its knees. Mactaggart wanted to give consumers the right to make companies like Facebook and Google stop sharing or selling their data. So he spent a few million dollars gathering signatures, and qualified his measure for the November ballot. Although he says this wasn’t his original plan, he used that leverage to strike a deal — and withdrew his initiative. Needless to say, the tech industry wasn’t pleased. Mactaggart knows the industry will try to weaken the law next year. That’s the calculated risk he took in exchange for not having to roll the dice with voters, or spend more of his money on a campaign. And, he points out, a law with such strong industry opposition never would’ve passed without the initiative as leverage. Also this year, the paint industry withdrew a controversial effort to shift liability for hundreds of millions of dollars of lead paint cleanup in homes from the industry to the state. As part of the deal to withdraw the initiative, lawmakers agreed not to move forward with several bills targeting the industry. And at one point, there was a chance the $100 million rent control battle that’s clogging your commercial breaks and mailboxes might never have become Proposition 10. But negotiations between the measure’s supporters and opponents broke down. This isn’t the first election cycle that the law served as leverage. In 2016, two different minimum wage measures backed by two different labor unions were both withdrawn after the Legislature and Gov. Jerry Brown passed the law that’s gradually phasing the state up to $15 an hour. And already, an epic battle is shaping up for 2020: Labor unions and progressive groups have qualified a ballot measure known as “split roll” that would shatter the cornerstone of the state’s tax system, Proposition 13, by taxing commercial property differently than residential property. Lapsley expects it’ll be part of broader negotiations to overhaul the state’s tax system. “That’s a piece that helps stimulate — and everybody knows it — that discussion,” he said. Meanwhile, a new state law passed earlier this year extends this same negotiation window to local ballot measures. So welcome to the new normal — the next iteration of California’s direct democracy process. The California Dream series is a statewide media collaboration of CALmatters, KPBS, KPCC, KQED and Capital Public Radio with support from the Corporation for Public Broadcasting and the James Irvine Foundation.